For contractual reasons, "Ray Vernon" was originally listed as the artist on "Big City After Dark." 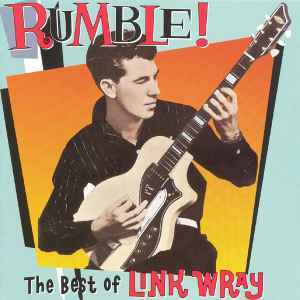 Source of tracks: 1-2: Cadence single #1347, 4/58; 3-4: Epic single #9300, 1/59; 5: from the album Link Wray & The Wraymen, Epic #3661, 2/60; 6: Epic single #9419, 10/60; 7: Rumble single #1000, 7/61; reissued as Swan single #4137, 3/63; 8: Swan single #4137, 3/63; 9: Mala single #456, 11/62; 10: Swan single #4163, 10/63; 11: Swan single #4171, 2/64; 12: Swan single #4187, 7/64; 13 & 15: Swan single #4211, 5/65; 14: Swan single #4239, 1/66; reissued as Swan single #4261, 7/66; 16: Swan single #4244, 1/66; 17: Swan single #4261, 7/66; `8: From the album Yesterday-Today, Record Factory #1929, 1970; 19: From the album Bullshot, Visa #7009, 1979; 20: from the album Stuck In Gear, Virgin [UK] #2050, 3/76. Track 15 "I'm Branded" - credit for Organ is questionable since the track clearly has rhythm guitar and piano but no organ.